Interiors or even exteriors renovation, at least every few years, is something completely obvious. After all, this is where your guests enjoy their stay and build memories - everything should be perfect here. And what about the website? It often takes a long time to refresh, even though it is a business card of your hotel and an important booking channel. Find out why you should have a new site at least every four years. Have you noticed that some fashion trends stay with us for a long time, and some of them disappear as soon as they appear? It happens to all IT solutions and gadgets. When a given trend is related to the design and usability of a website, its survival depends mainly on the users’ acceptance of it. When it significantly improves viewing comfort, then the solution is very likely going to be accepted and treated as an essential element of any website. It is worth noting because, in the case of hotel websites, implementing improvements directly translates into the number of bookings. What are the users currently used to then? First of all, to minimalistic design. It’s a trend that may have started 4 years ago, but it reached its highest popularity around 2017. Webpages became much simple, transparent, with a very straightforward menu. Also, logotypes and icons are subject to the same trend. In general, branding elements stopped attacking websites’ visitors, they moved to the background while content became much more important. This doesn’t mean that a website needs to be black and white. Quite the contrary - the colour becomes more and more important, but its role isn’t just to diversify the content. All sorts of subtle gradients, brand-related highlights are now attracting attention to the right place. This the main colour’s role in 2019. Another important element is motion and/or animations. Human eyes naturally follow any movement, so all kinds of animations are a great tool to attract the attention of our visitors to the place where we want their to focus to be. While 3 years ago, motion was not so popular, at the moment animations can be placed both in the background of a page or directly on it as an element of the content. No one is surprised by video galleries or streaming videos on websites anymore. Animations also show up in previews when one hovers over a web page element. This kind of functionality speeds up browsing of the content because it reduces the need to go through subpages. If you haven’t integrated such previous on your website yet, then you have to be prepared for the fact that a visitor can easily be discouraged by the need to browse the offers and may choose another hotel which website will be easier to use. The above visual trends are also related to the way your hotel is presented on the website in terms of pictures taken there, and to the message your picture galleries and photographs sent to the guests. The pictures should be consistent with your brand colour palette. They also need to be consistent among themselves, processed in a similar fashion and they all should contain an element in the main brand colour. It may be the right moment to look at the graphics and photos on the website, choose a common theme for them and order a new photography session, and then adjust the website palette. Another reason why you should consider renewing pictures on the website may be a refurbishment, any change in the decor or any other even minor changes in the appearance of the hotel that has occurred in the last few years. In such case, consider refreshing the whole website so that everything is consistent and modern. Website renovation sends one more message to your potential guests. Based on what the website looks like, one very often concludes about the entire institution, e.g. how modern or how accommodating it is. 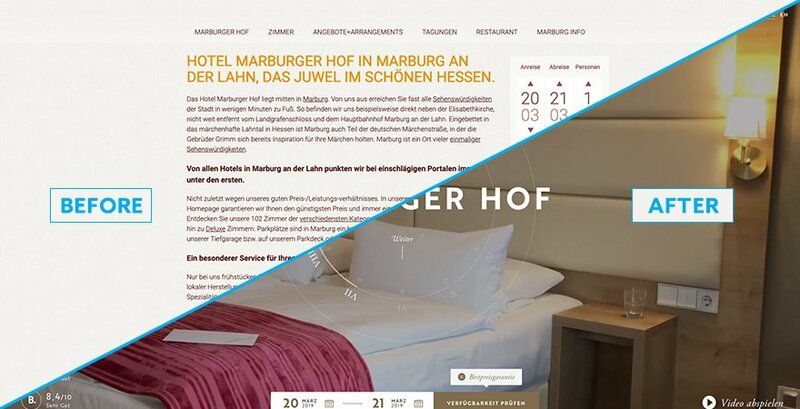 It's worth making sure that your hotel's site does not look outdated in any way. You’ll achieve this by refreshing it or a regular basis. At the same time, you’ll also make sure that it’s prepared for the next few years of trouble-free work. The users' requirements are growing year by year. We want faster and better optimized websites. Users no longer want to wait a few minutes for a page to load, especially on a mobile device. The basic requirement is, therefore, the responsiveness of the website and its mobility, i.e. adaptation to devices such as tablets and smartphones. Four years ago, the number of mobile devices was much lower than today. It has grown from 3.6 billion to 5.1 billion during the last 4 years, so it’s almost doubled! This means that websites must be optimised for mobile browsing as mobile devices are more and more popular. An additional advantage of renewing a website will be its better optimization in terms of SEO. Google's algorithms are not static and they are constantly evolving. Keeping track of these changes and applying appropriate corrections to the site should be an indispensable element of any website work, just like posting interesting content is. If your site is old and has not been renewed for years, the new one will additionally allow SEO adjustments which were previously not possible. Over the past 4 years, a lot has happened in the area of ​​web application security. Such examples as the SSL certificate and GDPR requirements are just the most visible tip of the iceberg. Same important is active protection against "vulnerabilities", i.e. weaknesses of the IT system, resulting from internal errors or user errors. There are about 40 vulnerabilities detected on a daily basis of which ⅓ are related to web applications (i.e. websites). There are also many security issues with SSL certificates. What are you risking if you don’t take care of them? Some examples are exploitation of administrator privileges and unauthorized changes on your hotel's website! If you decide to order a new website, it will have all the current security patches, but make sure that the support you are offered will also cover regular security updates. Only then you will be able to sleep peacefully, without worrying about the fact that your guests' data may fall into unauthorised hands or that you will lose your guests’ trust. So if you have not looked at your website for a long time, either in terms of its usefulness or on the way it presents your hotel, then make sure everything is ok. You can do this as part of 2019 Spring Cleaning. If you feel it's time for a change, contact us and you'll find out what are the three main modifications that should be done on your website.